Seiko has just announced the first high beat Grand Seiko GMT, equipped with the newly developed 9S86 automatic movement running at 36,000 bph, inside the larger, 44GS type case. 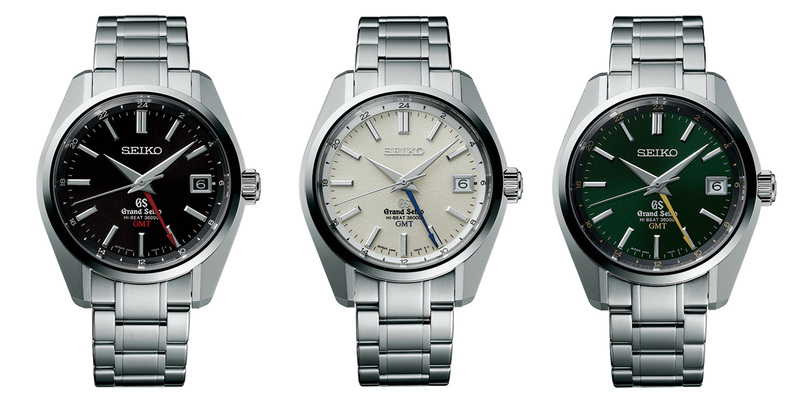 The flagship product of the Grand Seiko line-up at Baselworld 2014, the new Grand Seiko Hi-Beat GMT is the most complicated mechanical (as opposed to Spring Drive) Grand Seiko timepiece yet. It features the new 9S86 movement, which combines a second time zone function with the high beat escapement, combined with the 44GS style case unveiled last year. Running at 36,000 bph, the 9S86 movement is tested to an average daily rate of -3 to +5 seconds and has a 55 hour power reserve. The second time zone hand can be adjusted in one hour increments, backwards or forwards, via the crown. A moderate 40 mm in diameter, the steel case has the broad, polished flanks characteristic of the 44GS of 1967, which was just reissued as a limited edition last year. It is water-resistant to 100 m, with sapphire crystals front and back. Three models are available, all in steel on bracelet. 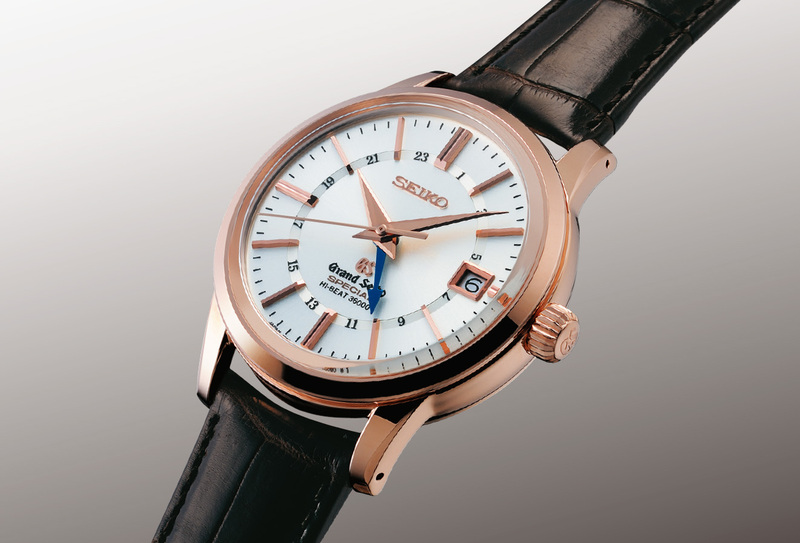 The most classical is the SBGJ001 with a white dial decorated with a fine radial guilloche and a blued steel GMT hand. Slightly more sporty is the SBGJ003, which has a glossy black dial with red accents. And limited to 600 pieces is the SBGJ005, which has a rich green dial sporting the same radial guilloche as the white version. This is inspired by the summer colours of the woodlands around the Shizukuishi Watch Studio in Iwate prefecture, where all mechanical Grand Seikos are manufactured. 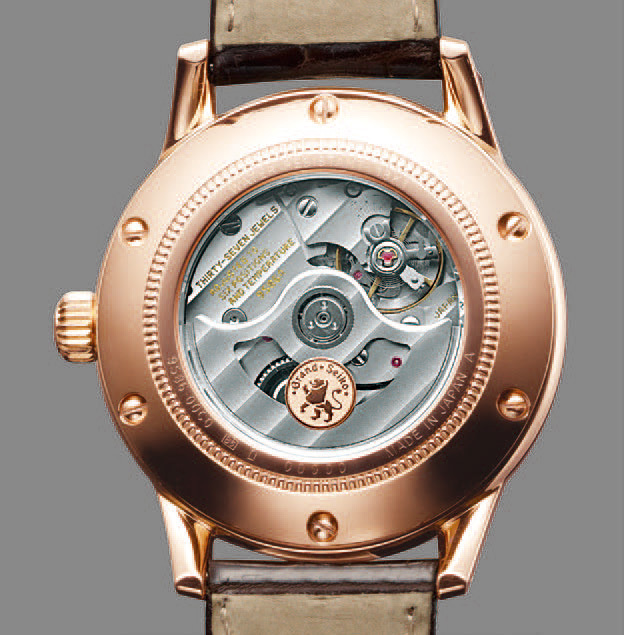 The limited edition also has a titanium rotor treated with an anodic oxidation process to give it a gold finish. These will be available around the middle of 2014, with the standard models retailing for €6700 (~US$9210) and the green dial limited edition €7050 (~US$9700). And for those who value chronometry and prefer more formal designs, a limited production Grand Seiko Hi-Beat GMT regulated to the “Special Grand Seiko” test will also be available, but only in Japan. These are only available in gold, with production limited to only 200 pieces a year in all metals. With blue steel GMT hands, the dials are classically styled, much like the classic Grand Seiko GMT, except the indices are slimmer and the GMT numerals are on a brushed circular track. 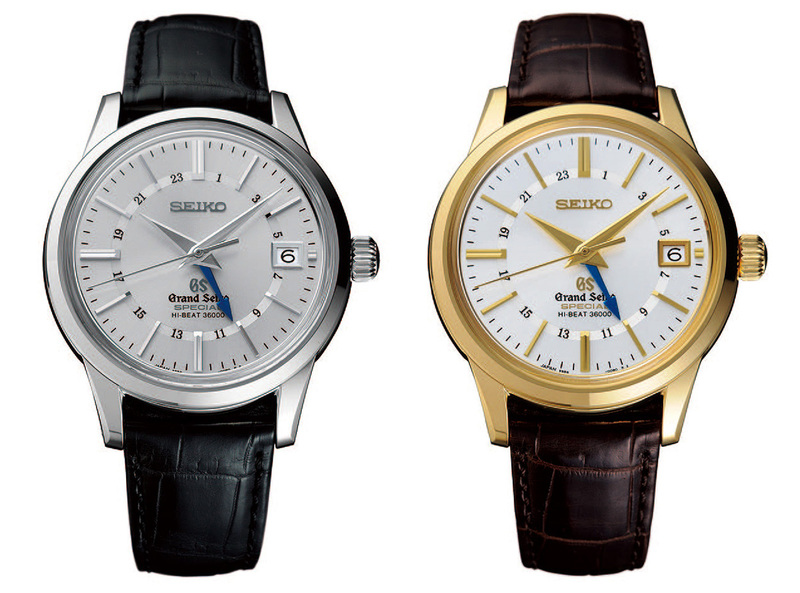 The “Special” at six o’clock is the only indication that they are top of the line Seiko chronometers. Each version has a solid gold Grand Seiko medallion set into the rotor of the movement. 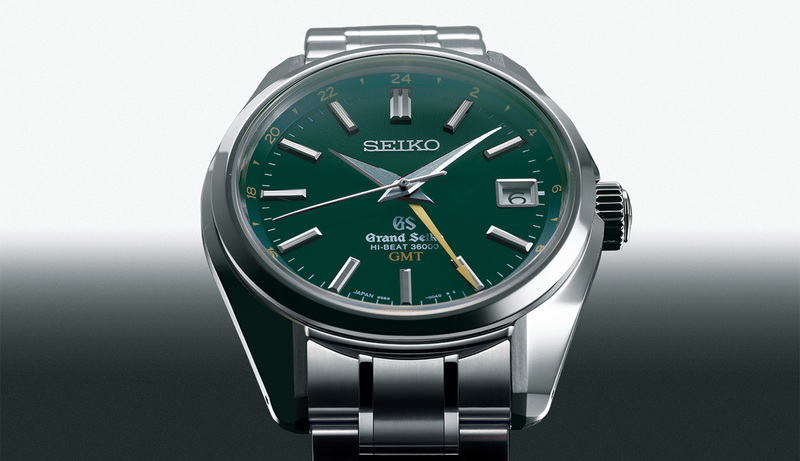 These use the same 9S86 movement as the regular models, except they are adjusted to meet the even more stringent requirements of the Special Grand Seiko test, which is compared with the standard Grand Seiko criteria below. 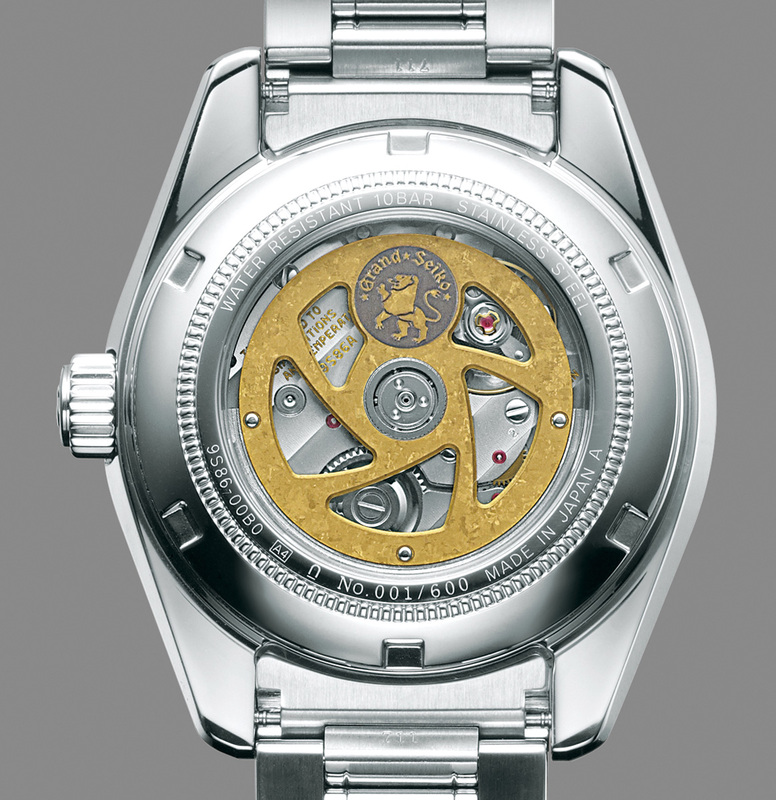 The white gold model (SBGJ007) is priced at 2 million Japanese yen, equivalent to US$19,500. The yellow gold (SBGJ008) and rose gold (SBGJ010) versions are 1.9 million yen, which is about US$18,500.